Kaylee Kingseed with her parents, Eastern AD Brad Wilson and Eastern girls golf coach Mike Hamilton. GREENTOWN, Ind. – Eastern High School Athletic Director Brad Wilson has orchestrated dozens of college signing ceremonies for Comet student-athletes. But in all of his time, he has never witnessed the collegiate signing of a Lady Comet golfer. 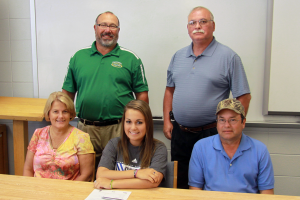 But that all changed on May 18 when Kaylee Kingseed signed to play collegiate golf at the University of St. Francis in Fort Wayne. Comet girls golf coach Mike Hamilton said this is a very proud day for Kingseed and the entire golf program at Eastern. Kingseed said she chose St. Francis for several reasons, including its proximity to Greentown, its nursing program, and the friendliness of the golf team. Kingseed holds the Lady Comets nine-hole (34) and 18-hole (76) school records, and was an IHSAA regional qualifier her senior year after posting an 88 in the sectionals. She fired the 76 to finish fourth in the 2011 Mid-Indiana Conference meet held at the American Legion Golf Course in Kokomo. But she remembers a day when records were not even a dream. Kingseed said she will have to work on her short game if she wants to see success for the Lady Cougars, while the strong part of her game is putting. Wilson said St. Francis coach Michelle Smith was fortunate to recruit a student-athlete the caliber as Kingseed. And as the hallways of Eastern bid adieu to Kingseed, the campus of St. Francis will open its arms to the best Lady Comet golfer of all time. This entry was posted in Cougars, Eastern, University of St. Francis. Bookmark the permalink.